WHY VOTE FOR JIM RICE? Jim is a business owner, a husband and a father who considers serving on the Board of Trustees of Fort Bend ISD both an honor and a privilege. 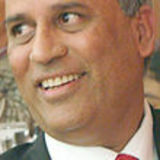 He has served as Trustee, Position 3, since May of 2010. He was elected Board Secretary in June 2011 and Board President LQ  VHUYLQJ WZR FRQVHFXWLYH WHUPV LQ WKDW RIILFH +H FXUUHQWO\ VHUYHVRQWKH Boardâ&#x20AC;&#x2122;s Audit Committee. With your vote, Jim will continue to serve to make a difference! Sponsored by Serving Fort Bend County for 28 years! The Remembrance Project Executive Director Maria Espinoza highlights “The stolen lives quilt” memorializing the Texas victims killed by illegal immigrants. Rally organizer Karen MacWilliam, right, holds a counter placard. A lone veteran is holding a placard against the wall. the border spend $1 billion, the U.S. Border Patrol does not have similar resources, Louderback said. “If we cannot protect our sovereign borders, what have we become,” he asked. and food trucks — as well as vendors oﬀering a variety of pooch-worthy items. The ﬁrst 200 dogs that arrived received pup-friendly swag bags. Golden Paw sponsor Nature Dog Photography snapped “Doggie & Me” photos. Fort Bend Animal Services staﬀ members were on-site with opportunities to Adopt A Dog for a Day. The program allows potential dog owners to spend time with shelter dogs with the hope of ﬁnding them a “fur-ever” home. Presented by Lake Olympia Animal Hospital and Sugar Land Veterinary Specialists, Bark for Life celebrates the role dogs can play providing support, love and healing for cancer patients. Other sponsors included Best Entertainers, Natural Pawz and All Around Bounce. It is one of many charitable events Riverstone hosts throughout the year. Homes in the community are priced from the $300,000s. Families of victims killed by illegal immigrants said “it is not a manufactured crisis.” Those who oppose the wall and refuse to implement the immigration laws are providing “blood sacriﬁce for their agenda” in letting the illegals kill innocent people, they said. Commissioner Meyers called for transparency among taxing entities. Various special districts and management districts are currently not transparent. He is working with the legislature to enact bills that would force the special districts to tell taxpayers how much money is collected and how they are spent. Big law ﬁrms from Houston trying to scuttle it, he said. DeLay said: “I don’t want to stop socialism; I want to reverse it.” Republicans have not been a “ﬁrewall” against socialism as claimed by some leaders, DeLay said. Socialism started with Theodore Roosevelt and continued forever. “I don’t want to be a ﬁrewall. I want to turn it around,” DeLay said. “God was the core principle and we got our rights from God, not Government,” he said. The Constitution and this country was born with God at the center, he added. Now, the Constitution has been shredded little by little. Socialists are so emboldoned that they are openly admitting they are socialists, he said. “The Supreme Court is not supreme. The only court created by the Constitution is the Supreme Court. Congress creates all other courts. If Congress can create, it can uncreate some of the courts, alluding to the Circuit Court of appeals,” DeLay said. Per Article 3 of the Constitution, Congress can tell the courts what cases to hear and what cases not to hear, according to DeLay. For example Bible in schools, or prayer in schools cases can be declared out of bounds for courts. Phone: (281) 208-4470 Download the free FBInd App from the Apple Store or Google Playstore for a pleasant reading of Fort Bend Independent on your mobile phone. TO THE QUALIFIED ELECTORS OF FORT BEND COUNTY LEVEE IMPROVEMENT DISTRICT NO. 2 AND TO ALL OTHER INTERESTED PERSONS: Notice isNotice hereby given that will be by Fort Bend County DistrictNo. No.2 2 is hereby givenelections that elections willheld be held by Fort Bend CountyLevee LeveeImprovement Improvement District (the “District”) on May 4, 2019, between the hours of 7:00 a.m. and 7:00 p.m., for the purpose of voting upon (the “District”) on May 4, 2019, between the hours of 7:00 a.m. and 7:00 p.m., for the purpose of voting upon the the following proposition. Election Day polling locations are specifi ed on following proposition: Election Day polling locations are specified on Exhibit A. Exhibit A. La votación anticipada en persona se llevará a cabo en los lugare indicados durante las fechas y los horarios especificados en el Anexo B.
Las solicitudes de boletas de votación por correo deberán ser enviadas a: Early Voting Clerk Fort Bend County Elections Office 301 Jackson Street Richmond, Texas 77469-3108 Correo electrónico: Elections@abhr.com Las solicitudes de boletas de votación por correo deben ser recibidas antes de las 5:00 p.m. del 23 de abril de 2019. SHALL THE BOARD OF DIRECTORS OF FORT BEND COUNTY LEVEE IMPROVEMENT DISTRICT NO. 2 BE AUTHORIZED TO ISSUE THE BONDS OF SAID DISTRICT IN ONE OR MORE ISSUES OR SERIES IN THE MAXIMUM AMOUNT OF $88,000,000 MATURING SERIALLY OR OTHERWISE IN SUCH INSTALLMENTS AS ARE FIXED BY SAID BOARD OVER A PERIOD OR PERIODS NOT EXCEEDING FORTY (40) YEARS FROM THEIR DATE OR DATES, BEARING INTEREST AT ANY RATE OR RATES AND TO SELL SAID BONDS AT ANY PRICE OR PRICES, PROVIDED THAT THE NET EFFECTIVE INTEREST RATE ON ANY ISSUE OR SERIES OF SAID BONDS SHALL NOT EXCEED THE MAXIMUM LEGAL LIMIT IN EFFECT AT THE TIME OF ISSUANCE OF EACH ISSUE OR SERIES OF BONDS, ALL AS MAY BE DETERMINED BY THE BOARD OF DIRECTORS OF SAID DISTRICT, FOR THE PURPOSE OR PURPOSES OF PURCHASING, CONSTRUCTING, ACQUIRING, OWNING, MAINTAINING, OPERATING, REPAIRING, IMPROVING, EXTENDING, OR PAYING FOR, INSIDE AND OUTSIDE THE DISTRICT’S BOUNDARIES, ANY AND ALL DISTRICT WORKS, IMPROVEMENTS, FACILITIES, PLANTS, EQUIPMENT, AND APPLIANCES NEEDED TO PROVIDE A LEVEE SYSTEM AND DRAINAGE SYSTEM, INCLUDING, BUT NOT LIMITED TO, ALL COSTS ASSOCIATED WITH FLOOD PLAIN AND WETLANDS REGULATION (INCLUDING MITIGATION) AND ENDANGERED SPECIES AND STORMWATER PERMITS (INCLUDING MITIGATION) AND ALL ADDITIONS TO SUCH SYSTEMS AND ALL WORKS, IMPROVEMENTS, FACILITIES, PLANTS, EQUIPMENT, APPLIANCES, INTERESTS IN PROPERTY, AND CONTRACT RIGHTS NECESSARY OR CONVENIENT THEREFOR AND ADMINISTRATIVE FACILITIES NEEDED IN CONNECTION THEREWITH, AND FOR THE PURPOSE OF REFUNDING BY ANY MEANS NOW OR HEREAFTER AUTHORIZED BY LAW, ALL OR ANY PORTION OF BONDS OF THE DISTRICT HERETOFORE OR HEREAFTER ISSUED FOR SAID PURPOSES, AND TO PROVIDE FOR THE PAYMENT OF PRINCIPAL OF AND INTEREST ON SUCH BONDS BY THE LEVY AND COLLECTION OF A SUFFICIENT TAX UPON ALL TAXABLE PROPERTY WITHIN SAID DISTRICT, ALL AS AUTHORIZED BY THE CONSTITUTION AND LAWS OF THE STATE OF TEXAS? Main Early voting by personal appearance will be conducted at the location listed during the dates and hours specified on Exhibit B. Applications for ballot by mail shall be sent to: Early Voting Clerk Fort Bend County Elections Office 301 Jackson Street Richmond, Texas 77469-3108 Email: Elections@abhr.com Applications for ballots by mail April 23, 2019. AVISO DE ELECCIÓN DE BONOS PARA LOS VOTANTES HABILITADOS DE DISTRITO DE MEJORAS DE DIQUES NRO. 2 DEL CONDADO DE FORT BEND Y DEMÁS PERSONAS INTERESADAS: Se notifica por el presente que el Distrito de Mejoras de Diques Nro. 2 del Condado de Fort Bend (el “Distrito”) celebrará elecciones el 4 de mayo de 2019 en el horario de 7:00 a.m. a 7:00 p.m. con el propósito de votar por la proposición que sigue a continuación. Los lugares de votación anticipada son indicados en el Anexo A. DISTRITO DE MEJORAS DE DIQUES NRO. 2 DEL CONDADO DE FORT BEND DISTRITO DE MEJORAS DE DIQUES NRO. 2 DEL CONDADO DE FORT BEND PROPOSICIÓN A (BONOS PARA INSTALACIONES DE DIQUES Y DRENAJE) ¿SE DEBERÁ AUTORIZAR A LA JUNTA DIRECTIVA DEL DISTRITO DE MEJORAS DE DIQUES NRO. 2 DEL CONDADO DE FORT BEND PARA EMITIR LOS BONOS DE DICHO DISTRITO EN UNA O MÁS EMISIONES O SERIES EN LA CANTIDAD MÁXIMA $88,000,000, CON VENCIMIENTOS EN SERIE O DE OTRA MANERA, EN DICHOS PLAZOS SEGÚN LOS DETERMINE DICHA JUNTA EN UN PERÍODO O PERÍODOS QUE NO EXCEDAN DE CUARENTA (40) AÑOS A PARTIR DE SU FECHA O FECHAS, DEVENGAR INTERÉS A CIERTA TASA O TASAS Y VENDER DICHOS BONOS A CIERTO PRECIO O PRECIOS, SIEMPRE QUE LA TASA DE INTERÉS EFECTIVA NETA SOBRE ALGUNA EMISIÓN O SERIE DE DICHOS BONOS NO EXCEDA EL LÍMITE LEGAL MÁXIMO EN EFECTO AL MOMENTO DE LA EMISIÓN DE CADA EMISIÓN O SERIE DE BONOS, TODO ESTO SEGÚN LO PUEDA DETERMINAR LA JUNTA DIRECTIVA DE DICHO DISTRITO, CON EL PROPÓSITO O PROPÓSITOS DE COMPRAR, CONSTRUIR, ADQUIRIR, TENER PROPIEDAD, MANTENER, OPERAR, REPARAR, MEJORAR, AMPLIAR O PAGAR DENTRO Y FUERA DE LOS LÍMITES TERRITORIALES DEL DISTRITO, TODOS Y CADA UNO DE LOS TRABAJOS, MEJORAS, INSTALACIONES, PLANTAS, EQUIPO Y APARATOS DEL DISTRITO NECESARIOS PARA SUMINISTRAR UN SISTEMA DE DIQUES Y UN SISTEMA DE DRENAJE, INCLUYENDO, PERO SIN LIMITARSE, TODOS LOS COSTOS RELACIONADOS CON EL REGLAMENTO DE LLANOS DE INUNDACIÓN Y TERRENOS PANTANALES (INCLUYENDO LA MITIGACIÓN) Y LOS PERMISOS DE ESPECIES EN EXTINCIÓN Y AGUA DE TORMENTAS (INCLUYENDO LA MITIGACIÓN) Y TODAS LAS ADICIONES A DICHOS SISTEMAS Y TODOS LOS TRABAJOS, MEJORAS, INSTALACIONES, PLANTAS, EQUIPO, APARATOS ELÉCTRICOS, INTERESES SOBRE LA PROPIEDAD Y DERECHOS CONTRACTUALES NECESARIOS O CONVENIENTES PARA ESTO Y LAS INSTALACIONES ADMINISTRATIVAS NECESARIAS EN RELACIÓN CON ESTO, Y CON EL PROPÓSITO DE REMBOLSAR POR ALGÚN MEDIO AUTORIZADO AHORA O DE AQUÍ EN ADELANTE POR LA LEY, TODOS O ALGUNA PORCIÓN DE LOS BONOS DEL DISTRITO EMITIDOS DE AQUÍ EN ADELANTE CON DICHOS PROPÓSITOS, Y PROPORCIONAR EL PAGO DEL CAPITAL E INTERÉS DE DICHOS BONOS MEDIANTE LA IMPOSICIÓN Y RECAUDACIÓN DE UN IMPUESTO SUFICIENTE A TODA PROPIEDAD GRAVABLE DENTRO DE DICHO DISTRITO, TODO ESTO SEGÚN LO AUTORIZADO POR LA CONSTITUCIÓN Y LAS LEYES DEL ESTADO DE TEXAS? Join the Texas A&M AgriLife Extension Service in Fort Bend County and the Fort Bend County Master Gardeners (FBCMG) for our Second Annual Butterﬂy Celebration to be held on Saturday, May 4, 2019, from 9:00 a.m until 12:00 p.m. This fun-ﬁlled, family-friendly celebration will include educational demonstrations and hands-on activities for children and adults, with a special focus on butterﬂy and pollinator gardening. Our celebration coincides with the annual Monarch Migration as they leave their winter home in Mexico and make their way north. Enjoy a natureﬁlled experience as you stroll through the FBCMG Demonstration Gardens and welcome the arrival of spring in Fort Bend County. The Demonstration Gardens are located behind the Texas A&M AgriLife Extension Service oﬃce at 1402 Band Road, Rosenberg, TX 77471. Admission is free and no registration is required to attend. To ﬁnd out more about the event, please visit fbmg.org, call 281.341.7068 or email FortBendmg@ag.tamu.edu. Under the Community Resources Division at the Fort Bend Chamber of Commerce, the Excellence for Nonproﬁt Leadership (ENL) program has been wildly successful for 16 years. The Fort Bend Chamber of Commerce, in partnership with The George Foundation, designed this program to strengthen nonproﬁt organizations and better equip them to serve the community. The program enhances the knowledge and skill sets of senior staﬀ, board members and engaged community members leading nonprofit organizations. Registration is now open for the 2019-2020 class whose 60 coveted spots traditionally ﬁll quickly. can be found at http://www. thegeorgefoundation.org/. As the only 5-star accredited and single-county chamber in the nine-county area surrounding the Houston Metroplex, membership provides both immediate and long-term beneﬁts for your business and helps build momentum for our community’s future. The Fort Bend Chamber recognizes that the non-proﬁt sector is a critical contributor to our economy. The Community Resources Division produces the Excellence for Nonprofit Leadership, Youth in Philanthropy, and other programs which allow us to serve this community of servant leaders. City of Missouri City LEGAL NOTICE THIS IS A MANDATED PUBLICATION OF THE LEGAL NOTICE ******* BID DUE DATE May 9, 2019 AT 2:00 pm. ******* Invitation for bid for the provision of Automobile Rental Services Commodity Code: 975-14 Responses must be sealed, marked on the outside of the delivery envelope with the ITB name and number as listed above, and the date of opening. Responses must be delivered to the attention of: City of Missouri City Attn: Purchasing Office – IFB No. 19-050 Automobile Rental Services 1522 Texas Parkway Missouri City, Texas 77489 Prior to the acceptance deadline. Responses marked improperly and therefore misdirected may be disqualified. Until final award of the contract, the City reserves the right to reject any or all responses, to waive irregularities or technicalities, to re-advertise, or proceed to do the work otherwise when in the best interests of the City. No bid may be withdrawn during the 60 days following the bid opening date. FORT BEND FAIR. BALANCED. INFORMATIVE. 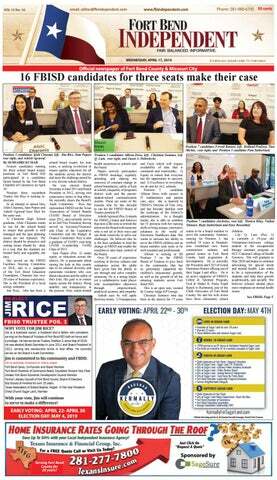 Fort Bend Independent, (USPS 025-572) is published every Wednesday (for a subscription rate of $20 per year) by Fort Bend Independent, LLC., 12551, Emily Court, Texas 77478. Periodicals Postage Paid at Stafford, Texas. POSTMASTER: Send address changes to Fort Bend Independent, P.O. Box 623, Sugar Land, Tx 77487. Enforcement Administration. As the misuse of prescription medications continues to rise, events such as this provide an easy, anonymous way for residents to dispose of drugs. Residents are cautioned against ﬂushing unwanted medications or putting them in the garbage as both methods pose potential safety and health hazards. Flushing drugs may pollute the water supply and throwing prescriptions in the trash makes them accessible to thieves, pets and wildlife, which could result in accidental poisonings and overdoses. Locally and nationally, the program has successfully helped to promote community awareness of the issue, to combat illegal use of prescription drugs and to provide a place for proper disposal of medications. When: Saturday, April 27 from 10 a.m. – 2 p.m. Where: Missouri City Police Department, 3849 Cartwright Rd. If individuals are unable to participate in the April 27, 2019 event, they may dispose of prescriptions in the “Drug Drop Box” in the Police Department Lobby. The box is accessible to residents year-round. Quail Valley has allowed him to receive lessons as well. “[Quail Valley] has stoked my passion for the game,” he said. “I’ve come up with this acronym for passion: P stands for perseverance A is assert yourself, always be attentive and have the proper attitude S is you want to share S is you want to seek knowledge I stands for integrity, be innovative O means be open-minded and not formulate opinions N means never give up.” To schedule a tee time with Brown, visit www.richardbrownschoolofgolf.com, email him at rabfore@icloud.com or call him at 832.457.5119. For more information about Missouri City, please watch the City website: www.missouricitytx.gov. The Fort Bend County Branch of the American Association of University Women (AAUW), an organization that advances equity for women and girls through advocacy, education, philanthropy, and research, is giving back to the community with a donation of $2,000 to Lamar Educational Award Foundation (L.E.A.F.). The donation will be used to help fund this summer’s S.T.E.A.M. camp project to further encourage young women in STEM pursuits. This gift was made in part by a memorial fund honoring late AAUW member Charlotte Magelssen. (L) Nancy Green, AAWU STEM co-chair, and (R) Janice Knight, Executive Director of L.E.A.F. and local governments and federal agencies. His experience includes work on a wide range of issue areas and on the federal budget and grants. Registration is open. Event Presenting Sponsorship: $500, includes reserved seating for 6, recognition at the event, and logo recognition on all printed and digital marketing materials. Member Reservation: $25. Prospective Member Reservation and onsite admission: $35. Breakfast included. Register today at www.FortBendChamber.com or contact Paige Talbott at 281-566-2152 or Paige@fortbendcc.org. The Fort Bend Chamber of Commerce Infrastructure Division educate and advocate for transportation, infrastructure and development programs throughout the region that promote opportunities for investment that encourage an improved quality of life in our region. Details of upcoming events can be found at www.FortBendChamber.com. states her motivation to run: “This is for my child, for your child, for every child in the district.” Monica Riley (Pos.7) who had her seven children educated in the district, is herself a graduate of Willowridge High School. having been associated with the school campuses and district as a whole in various capacities, for over 20 years is conﬁdent of her role as a board of trustee because she has worked well with the past and present board members. “ I am conﬁdent I can work collaboratively to increase the transparency and ensure accountability is achieved in our district for the best interest of all children and our communities. Over 20 years, I have served my community as an education activist and student advocate. My active involvement earned me the recognition as a community leader and lead organizer for more equity in education, stronger and sustainable school programs, and enhanced community partnerships.” In 2006 she joined the FBISD staﬀ as a seasoned Parent Educator for 12.5 years. She resigned from the position to fulﬁll “my divine purpose and respond to the call from the community for change! The community continues to suﬀer because of the lack of NOTICE OF CONSTABLES SALE THE STATE OF TEXAS COUNTY OF FORT BEND By virtue of an Order of Sale issued out of the Honorable 458TH DISTRICT COURT of FORT BEND County on April 3, 2019 by the Clerk thereof, in the case of FORT BEND INDEPENDENT SCHOOL DISTRICT, ET AL VS. NANCY PO CHEUNG, ET AL in Cause #18-DCY-251183 and to me, as CONSTABLE directed and delivered, I will proceed to sell, at 10:00 0’ Clock AM on the 7th day of May, 2019, which is the first Tuesday of said month, at the William B. Travis Building, First Floor Meeting Room. 301 Jackson Street, Richmond,Texas, 77469-3108 of said FORT BEND County, in the City of RICHMOND, Texas, the following described property to wit: TRACT I: GEO: 8100020020560907 LOT 56, BLOCK 2. TOWNEWEST, SECTION 2, A SUBDIVISION IN FORT BEND COUNTY, TEXAS, ACCORDING TO THE MAP OR PLAT THEREOF, RECORDED IN VOLUME 20, PAGE 9, OF THE MAP RECORDS OF FORT BEND COUNTY, TEXAS. Levied on April 4, 2019 as the property of NANCY PO CHEUNG, TOWNEWEST HOMEOWNERS ASSOCIATION. INC to satisfy a judgment amounting to $6,627.48, representing delinquent taxes, penalties, interest, and attorney’s fees through the date of judgment, plus all costs of court, costs of sale, and post judgment penalties and interest recoverable by law in favor of FORT BEND INDEPENDENT SCHOOL DISTRICT, FORT BEND COUNTY, FORT BEND COUNTY GENERAL FUND, FORT BEND COUNTY DRAINAGE DISTRICT AND FORT BEND COUNTY EMERGENCY SERVICES DISTRICT # 05. ALL BIDDERS MUST COMPLY WITH SECTION 34.015 OF THE TEXAS PROPERTY TAX CODE. Given under my hand on April 4, 2019. City of Missouri City NOTICE OF PUBLIC HEARING LOCATION/DATE: The City Council of the City of Missouri City will hold a public hearing on Monday, May 6, 2019, at the City Council Chambers – 2nd Floor, City Hall Building, 1522 Texas Parkway (FM-2234), Missouri City, Texas at 7:00 p.m. PURPOSE: To receive comments for or against a request by Eric Kot, KIPP Texas Public Schools to amend the regulations and restrictions of PD, Planned Development District #58 to allow for an educational place of assembly, to remove regulations and restrictions pertaining to a residential structure, and to extend the boundaries of the PD by rezoning an approximate 1.105 acre tract of land from I, Industrial; and to the extent such rezoning deviates from the Future Land Use and Character map of the Comprehensive Plan, to provide for an amendment therefrom. SITE LOCATION: The subject site is located north of the intersection of US 90A – South Main Street and S Gessner Road, south of Dixie Carpet, east of the intersection of Pike Road and S Gessner Road, and west of Ben E. Keith. SITE LEGAL DESCRIPTION: The subject site can be described as being all of the Replat of Unrestricted Reserve “A”, Global Geophysical Industrial Park, being an addition in Fort Bend County, Texas, according to the map or plat thereof recorded under plat no. 20110110 of plat records of Fort Bend County, Texas, same being comprised of all of Reserve “A-1” and all of Reserve “B-1” and all of Reserve “C-2” of Partial Replat Unrestricted Reserve “C” Gessner Road Commercial Park, Section 4, according to the map or plat thereof recorded under plat no. 20120031 of the plat records of Fort Bend County, Texas. FOR MORE INFORMATION: Additional information and a map of the subject site are available for review at City Hall, Missouri City, Texas on Monday through Friday from 8:00 a.m. to 4:00 p.m. You may call 281-403-8600 or email the Development Services Department-Planning Division at planning@missouricitytx.gov for further information. PUBLIC HEARING NOTICE The Commissioners Court of Fort Bend County, Texas has set a public hearing on Tuesday, May 7, 2019, at 1:00 p.m. for acceptance of the traffic control plan for Briarwood Crossing, Section 9, Precinct 1. The hearing will be held in the Commissioners Courtroom at 401 Jackson Street, Second Floor, Richmond, Texas. You are invited to attend and state your approval or objection on this matter. Download your free mobile app for Fort Bend Independent from the Playstore. her ﬁrst group of ﬁrst graders graduate from Staﬀord High. She taught ﬁrst grade for eight years, and has taught Kindergarten for the past eight. “I love my Kindergartners,” Diaz said. “I love teaching them how to read and seeing that light bulb go oﬀ.” During her time at Staﬀord Elementary, Diaz has gradually assumed more and more responsibility. She’s currently the campus’ ESL/Bilingual Coordinator. In addition to being a longtime SMSD employee, Diaz is a Staﬀord resident and the proud parent of two SMSD students. Nichols is in her fourth year as a Sixth Grade Science/ Social Studies teacher at Stafford Intermediate. Although she’s relatively new to public education, ‘teaching’ is nothing new for her. “When I graduated from Kindergarten in Clinton, Miss., the teacher asked the students, ‘what do you want to be when you grow up?’,” Nichols said. L to R Ready to celebrate the end of another successful school year is Joe Freudenberger, Laura Freudenberger, Linda Drummond Janice Knight and Donna Ferguson. Lamar CISD: OakBend Medical Center to present Surf’s Up The azaleas are in bloom, the wild ﬂowers are out, the cold weather is gone. Time to hit the beach because “Surf’s Up!” OakBend Medical Center is the title sponsor for the 2019 Surf’s Up School’s Out, with the Triumphs, beneﬁtting the Lamar Educational Awards foundation (L.E.A.F.). The dinner, dance and auction will be Friday, May 3 at the Fort Bend County Fairgrounds. Dinner is served from 6:30 to 8 p.m., with Commissioner Vincent Morales and Shorty Yeaman auctioning oﬀ 20 desserts immediately following. The dance starts at 9:00 p.m. with entertainment by Fort Bend County’s favorite party band, The Triumphs. Funds raised at Surf’s Up underwrite grants for Lamar CISD teachers. More than $451,000 was awarded by the L.E.A.F. “Grant Express” in 2018. Since 2000, L.E.A.F has awarded more than $3.8 million dollars in grants for innovative classroom project. Individual tickets are $25, which includes a chicken-fried steak dinner catered by Vincek’s. Reserved tables for eight are $250. For ticket information or to reserve tables for Surf’s Up, contact Janice Knight at 832-2230334 or online at www.leafgrants.org. Mayors to proclaim April Autism Awareness Month. You can be part of this grand day of excitement and root on the home team by purchasing your $12 reserved stadium seat ticket at hopeforthree.org/events. Half of the ticket price is donated to Hope For Three. If purchasing on Skeeters web site, please enter code: H43 purchasing game day tickets. There are also opportunities to volunteer event day and sponsor a family of four for $150. Details are on the hopeforthree. org website or call 281-2450640. Hope For Three Autism Advocates. Providing Help. Creating Hope. Since 2011.
include The Henderson-Wessendorﬀ Foundation, Houston Endowment, Fred and Mabel R. Parks Foundation, BGE, Sprint Waste, OCuSOFT, Gulf Coast Medical Foundation and Amegy Bank. “We need the community to step up now more than ever. I cannot think of a sector of our society who deserves attention more than abused and neglected children. A child who is brave enough to come forward and disclose abuse shouldn’t have to wait in line for help. We can’t have that in Fort Bend County,” said Olson. CAFB has a unique opportunity to receive a $1M matching grant from the J.E. and L.E. Mabee Foundation of Oklahoma if it raises $1.4 million in community support in the next nine months, essentially doubling the impact of every donation from now until the match is completed. For more information about the campaign or to learn about potential naming opportunities on the new campus, please contact Jessica Jubin, Development Oﬃcer & Campaign Manager jjubin@cafb.org (281) 344-5136.
meatballs and salmon puﬀs. She also showcased the variety of prepared meals that she has available for pre-order. Customers can special order prepared, fully cooked meals in advance for the week (minimum order of 3 meals) and not worry about messing up the kitchen at home. All meals are made with fresh ingredients and ﬁlled with ﬂavor…. Pure. Fresh. Local. In addition to their standard menu, Oﬀ the Vine oﬀers patrons a vegan menu that is full of tasty choices for all courses of the meal. The restaurant opened its doors 4 years ago and enjoys providing patrons with wine dinner events, a wine club with a variety of wines from all over the world, catering and venue rental/reservations. Oﬀ the Vine Bistro, Restaurant & Bar is located at 2865 Dulles Avenue in Missouri City. To view their menu, visit www. oﬀthevinebistro.com. Oﬀ the Vine is open for dinner Monday through Saturday 5-9pm, lunch Friday through Saturday 11:30a.m – 2:30p.m, Happy Hour on weekdays 5pm – 7pm, open for brunch on Sunday 10a.m – 2p.m. Call 281.242.4186 to make your reservation to experience Oﬀ the Vine Bistro, Restaurant and Bar! tory in a way that encourages critical thinking and appropriate reﬂection,” said FBISD Superintendent Dr. Charles Dupre. “This discovery gives our FBISD students a unique opportunity to experience ﬁrsthand the realities of the convict-leasing system. We are excited that our students will directly beneﬁt from this historic discovery,” said Dupre. For more background information on the discovery of the historic cemetery, visit www. fortbendisd.com/historiccemetery.